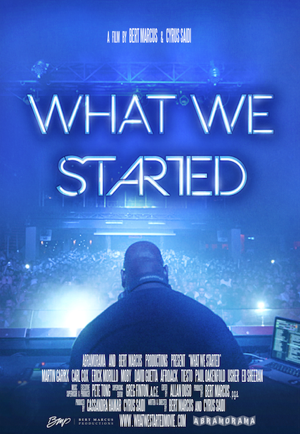 A look at the world of dance music that is framed via a dual biography of veteran DJ Carl Cox who has been spinning for decades and 18 year old Martin Garrix who has just broken through and is now head lining various festivals. How you feel about WHAT WE STARTED is going to be determined by how into the music you are. It is a good but basic overview of the history of the music, from pre-disco days on through the modern era, the film stall because there is a lack of context that makes the film drift away. Lots of names are mentioned over the course of the film but there is an assumption we know who everyone is and what certain clubs and festivals are.. Yes the whole history of the genre is here but it is in a kind of vacuum. As some one who likes the music but has no real sense of the history a great deal was lost because I had no idea what they were talking about. Another problem is that the dual stories of Cox and Garrix, while interesting and enlightening, but they are simply not enough to support 100 minutes of screen time. Yes they are both likable, but there just isn't enough here to be the focus of a feature. Not having enough here is also the biggest problem with the film visually. Largely a mix of talking heads and sequences watching people dance and DJs spin there is a point where it simply stops being interesting. The lack of compelling visuals is some thing other dance music docs have encountered but the ones I saw always managed to hide it in other ways such as one on the Electric Daisy Carnival showing us a lot of flash from the festival or another on DJ Steve Aoki focusing on his life outside of spinning. Here we are very much focused on the people and while its intellectually interesting, it probably could have been an audio documentary. What does make the film interesting is the music. Its a wall to wall mix of various beats. Watching the film with headphones I found I was constantly in motion as the music moved my head and body. While not a bad film this is just not a really interesting one. 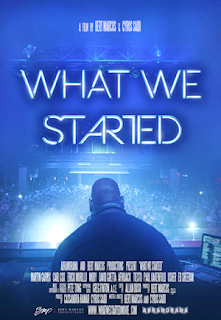 WHAT WE STARTED premiered at ULTRA Music Festival last night and is now in theaters.